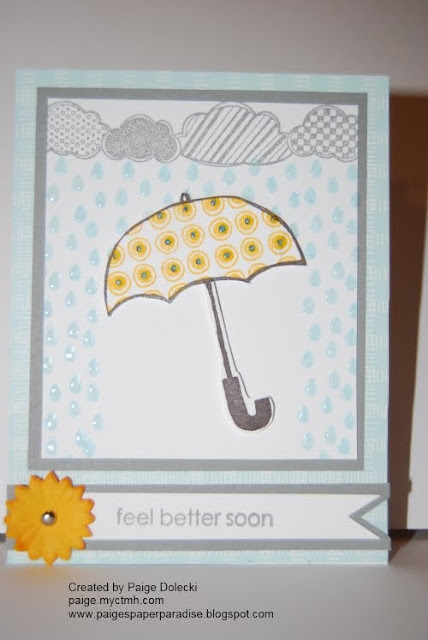 I needed a "feel better" kind of card the other day for a friend who is under the weather. Weather, weather...hmmmm....I know! I'll use my new umbrella stamp! (Yes, that really is how I think.) I've mailed off the one for my friend but I whipped up a couple of copies to have in my stash of cards. I try to make two or three of each card when I come up with a design that I like. That way I can put them in my personal stash for use or give them away as prizes at parties. The clouds are from the set True Happiness mixed with the rain drops and umbrella from Springtime. 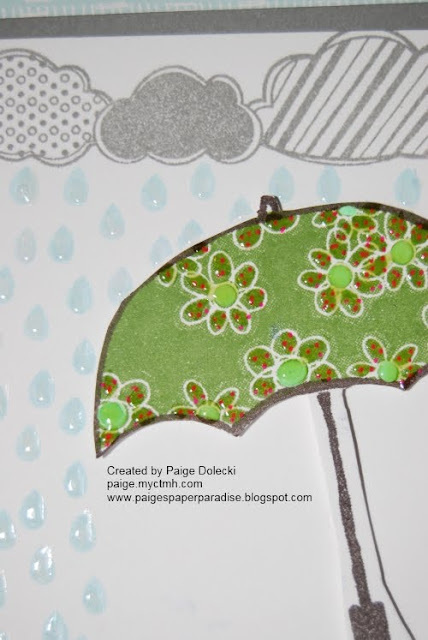 I really like that Springtime comes with three different patterns for the umbrella so you can make a more masculine card easily by using the plaid or dotted pattern. The rain drops were given a little dollop of liquid glass to give them shine and the umbrella got the same treatment for some added dimension. I was trying to keep it fairly flat for mailing so the only big bump is the button on this card and they usually go through the mail pretty good. For those of you who do mail out handmade cards, one of the tips I've used is to take a paper towel or paper napkin and place it over the "bumpy" parts to help keep the envelope from ripping. I send cards across country to my family back east and they've all come without damage so far using that technique. Here is a close up of the liquid glass on the rain and umbrella. I've picked out the pattern in the umbrella with some gel pens to give it some more dimension and the button above has a rub on placed on top. 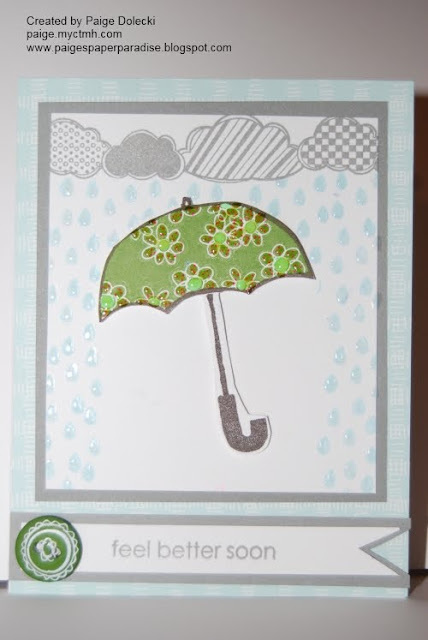 Here is a more masculine version using the dotted umbrella pattern.